*Self-identified as belonging to a racial or cultural group other than “White” (does not include Aboriginal). Children living in low income were more likely to live in families whose parents scored high on the family dysfunction*** scale than were those living in higher income families in 2010/11. That was also the case among children who were visible minorities and recent immigrants. 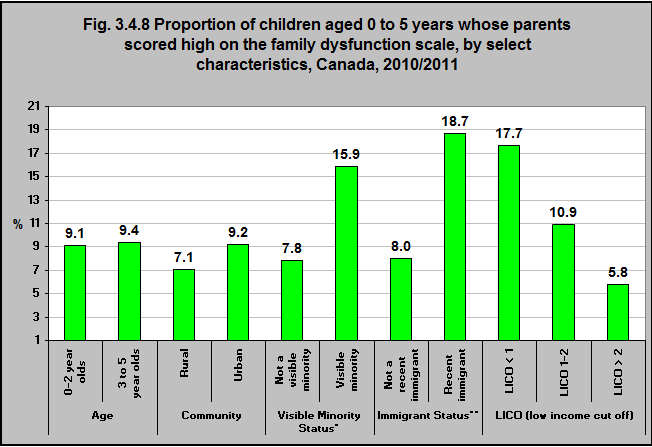 ***The National Longitudinal Survey of Children and Youth (NLSCY) and Survey of Young Canadians (SYC) measure family functioning by looking at how well a family works together – for example, how they solve problems, communicate, treat each other emotionally and assume their various roles. Parenting has a significant impact on the health and development of young children. The more consistent parents are in their support and discipline, the more they communicate with their young children and the more they nurture them physically and emotionally, the better off their children will be. Some groups of parents may require more supports and programs to help them nurture their children. For example, some face challenges related to low income and socio-economic status, or, in the case of immigrant and refugee parents, they may face language and cultural barriers, along with a lack of awareness of services and resources in Canada.